In a Nutshell...: Viva Las Vegas! BUT BEFORE THAT, I got to spend a little time doing something a little more fun. Viva, the ever famous rockabilly weekend at the Orleans, took place the weekend prior to NAB and I got to spend a little time at the car show and outdoor vendors with my girl, Bristol. I feel fortunate that I was able to spend a couple hours doing so. 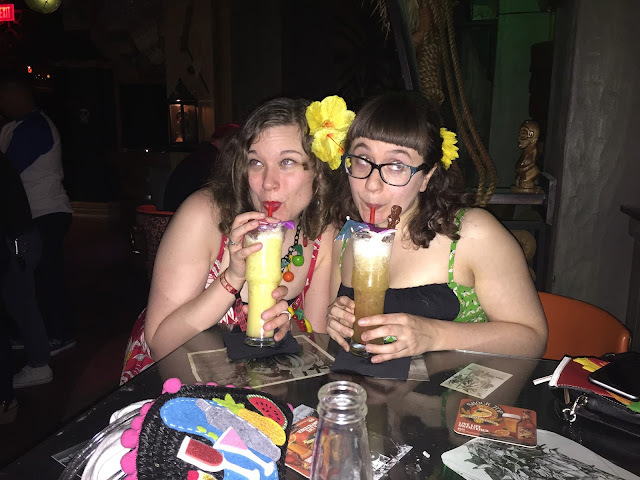 I flew in on Friday morning, allowing me to get some work done for the booth during the afternoon and then sneaking out that evening for some burgers with Bristol and her hubby, Bob, and then some tiki fun at The Golden Tiki and the famous, Frankie's Tiki Room, with some other gals from Instagram. I even got myself a cute Tiki glass to bring home to Cody. Always so fun being with Bristol and our gal pal, Kristina! Saturday morning, prior to heading to the booth for setup, I met Bristol and Bob and they took me to Viva, where we shopped at the vendors, scored some awesome deals, and took a peek at some awesome old cars. I had to sneak off by noon to get to work so I didn't get to see a lot of the cars, but I did a good job at making use of the time I had and getting to almost every vendor tent. It was so surreal, as it always is, to be surrounded by girls that are dressed like I am. 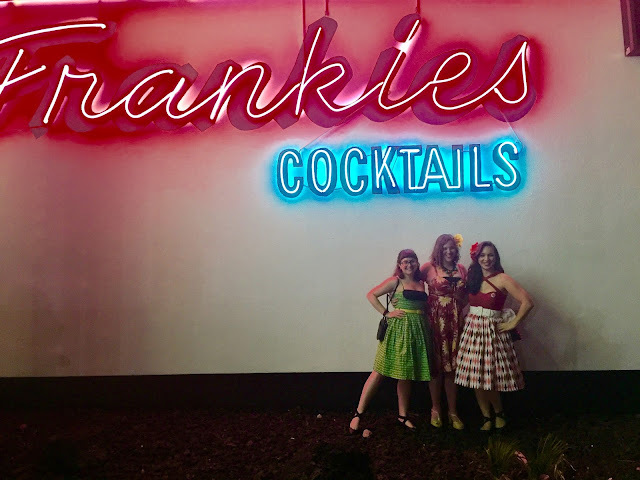 I am so used to standing out and being the only one in a petticoat and red lips that it almost feels weird to be among other retro gals. It's definitely a change! I snagged a beauty of a dress from the Unique Vintage tent, a few items from Shop VDM (Viva Dulce Marina), and more. Keep an eye out for some of these items soon on this very blog! You know I would never tease you and not share them with you, right? Bristol did great on site as well - snagging some gorgeous hair flowers to add to her collection and more. 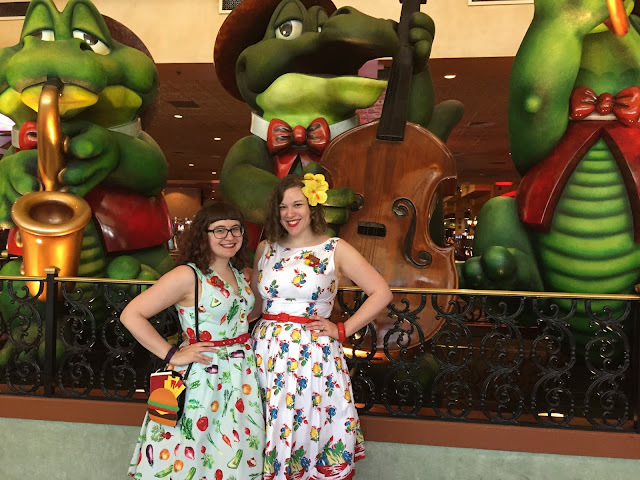 We even bought the same skirt - twinsies! 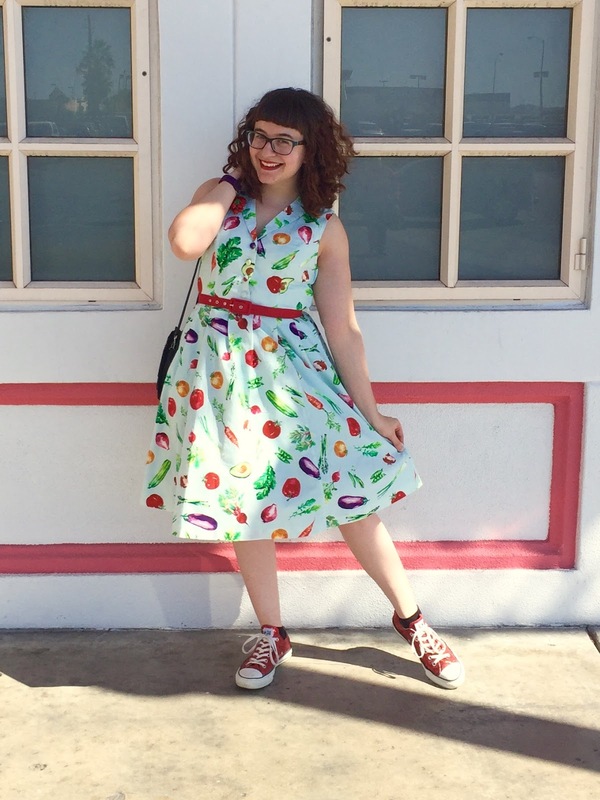 As for what I wore, I donned one of ModCloth's newest add to their label, It's an Inspired Taste dress. I ordered it over a week ago and sized up in fear of the dress having no stretch, making the buttons gape. Sadly, when I got the large, it was much bigger than anticipated! The size chart says the L is a 30-31 waist but it measured at 32" so it does run a bit large! I should have known since other ModCloth label items also run a bit roomier. I nearly cried as I wanted it for Viva! I took the chance and ordered the medium instead of exchanging and guess what? It arrived Thursday night - right in time for me to pack it and take off Friday morning! Yay! The medium fits PERFECT and no gaping! 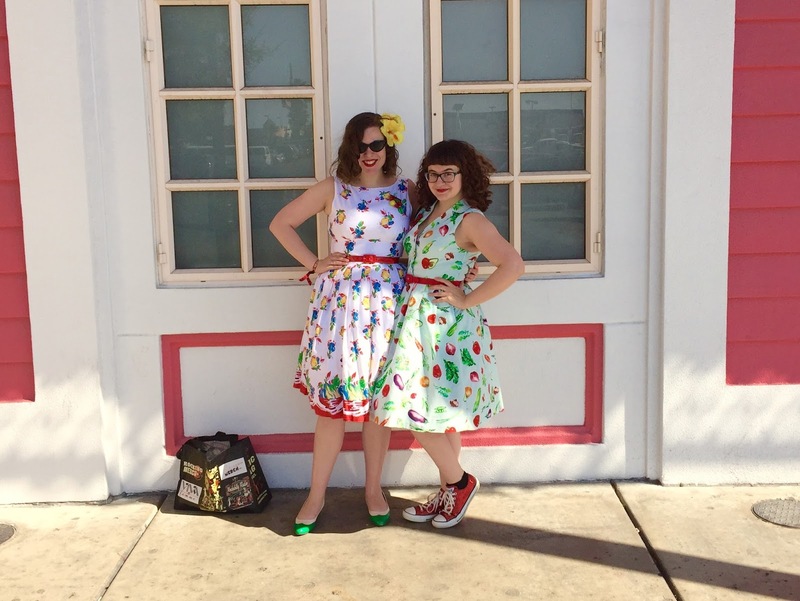 So many gals at the show were happily surprised to hear it was a new ModCloth dress. It's definitely a great new add to their line. 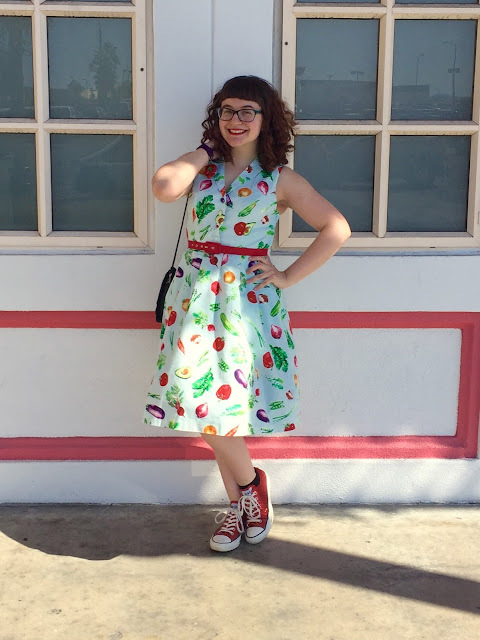 Who doesn't love a good veggie dress? I even wore it to a Mexican restaurant our staff loves in the MGM, Hecho, and we joked it was my guacamole eating dress. Ah, I had so much fun with you!!! So glad you got to see Viva, if only for a bit! :) We took some really cute pics, didn't we?? I'm so glad you enjoyed yourself, too! PS- My Modcloth veggie dress arrived today! Twinsies, yet again! 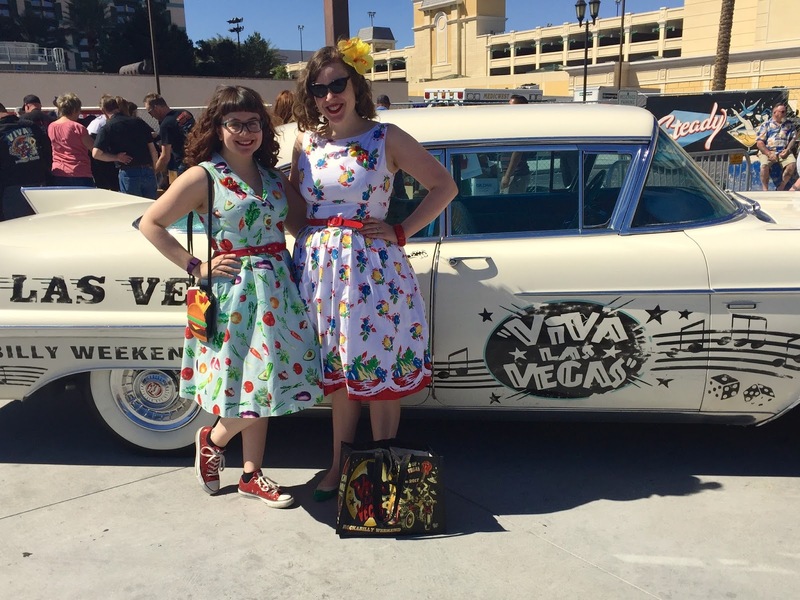 It's so awesome that you got to experience Viva first hand and to meetup with so many lovely vintage/rockabilly folks in the process. I smiled so big when I saw that you and Bristol were able to hang out. I adore you both and just love it when two bloggers I follow meet up. Tres cool!!! It looks like you ladies had a fantastic time! And I am so happy that your dress ended up working out just in time for Vegas. It's always awesome when that happens! Glad to hear that you have experienced Viva first hand. You both looks so happy and beautiful. And the dress looks so perfect on you. Would love to order the same one! Thanks and keep posting.